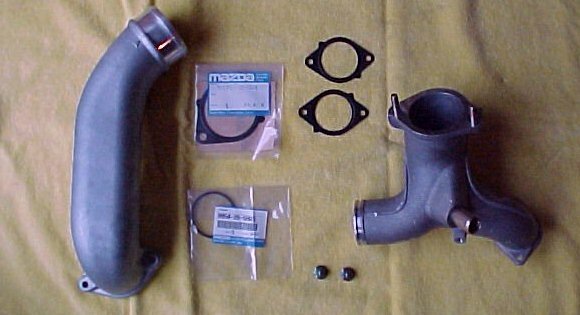 The OE turbo outlet intake piping consists of an alloy turbo "Y" pipe connected via a rubber coupling to a plastic cross-over pipe. The plastic crossover pipe is held in place, bolted in two locations, by a steel bracket mounted atop the air pump. Why am I telling you all this? Because the failure points of this setup are numerous. The rubber coupling commonly is blown off during high boost applications, the rubber itself also degrades rapidly under the very high temperatures seen local to the turbo's. The plastic crossover pipe frequently cracks at the bracket mounting points and at the rubber couplings usually due to over torquing the connector clamps, resulting in small hard to detect boost/vacuum leaks. The Efini "Y" pipe eliminates all of these problems. The crossover pipe (see above) is now aluminum so is not prone to cracking. This new aluminum piping also has a larger radiused bend for freer flow. And the rubber coupling has now been completely eliminated and is replaced by a flanged bolted connection (see above left) using a metal gasket. And to top it off the OE "Y" pipe has a design that has been improved upon for the '99 model year. 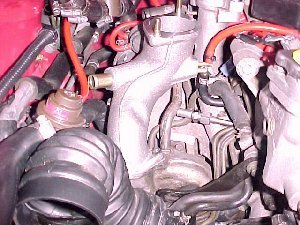 Specifically, the bung for the BOV on the older '93-'95 models protrudes directly into the compressor discharge flow path. (see below left) The '99 "Y" pipe has a flush fit bung (see below right) which provides minimal interference in airflow. All this makes for a more reliable configuration and a mild increase in intake flow efficiency. Thus, the turbos don't need to work as hard to generate boost and one might add quicker throttle response although I doubt you could feel the difference while driving. The installation was fairly straight forward. Removal of all the intake piping is required along with the air pump and possibly the airbox and intercooler. 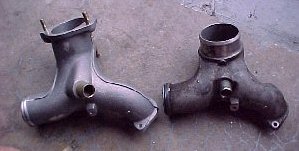 The only difficult part of removal of the old assembly, separation of the "Y" halves, is made easy provided the rear half of the "Y" is also loosened from the secondary turbo compressor outlet (rear hard intake pipe must be removed to do this) so the two halves can be separated. Once this is done the '99 efini pipes can be easily installed. 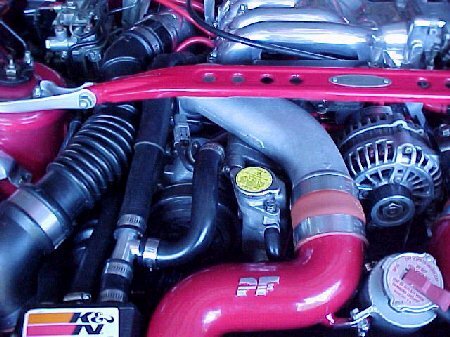 It is advisable that nothing be tightened down until the intercooler and crossover pipe are all connected as some minor adjustments are necessary to get everything lined up.